You can craft ear cuff jewelry with wire, gems and earring components. 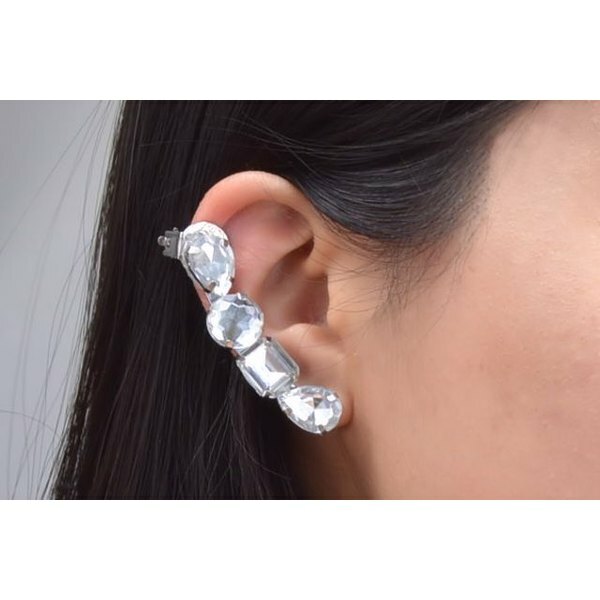 Ear cuffs, or ear climbers, are accessories designed to adorn the edge of the ear. These unconventional jewelry pieces aren't usually worn in pairs like traditional earrings. Because ear cuffs make such a statement, it is acceptable to wear only one. To make your own ear cuff, you need basic jewelry-making supplies. Using the cutting portion of the jewelry pliers, cut a strand of flat wire measuring 1 3/4 inches. Curve the wire by bending each end upwards. The curved wire lines up with the curved edge of your ear. Determine the placement of each gem. Glue the gems to the wire. Leave it to dry completely. Turn the ear cuff upside down, exposing the back side of the wire. To make a cuff for the right ear, glue the earring post on the left end. Glue the clip-on earring on the right end. To make a cuff for the left ear, glue the earring post on the right end. Glue the clip-on earring on the left end. Make sure the hinge of the clip-on earring lines up with the "outside" edge of the curved wire. To wear the ear cuff, insert the earring post through the pierced hole in your ear. Attach the backing to the earring post. Open the clip-on earring and attach to your upper ear.